Though Marrakech gets much more international attention, bustling and compelling Fes is equally intriguing and besotting. Considered to have one of the most authentic medinas in the Arab world, the sprawling city is the cultural and religious heart of Morocco, and its medieval maze of exotic souks and alleyways is not to be missed. 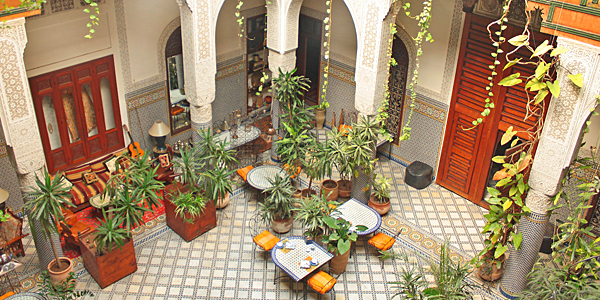 Amongst all of this is Riad al Bartal, an architecturally impressive guesthouse of zellig tilework and carved columns, with a beguiling serenity that contrasts with the dusty hubbub of the streets outside. 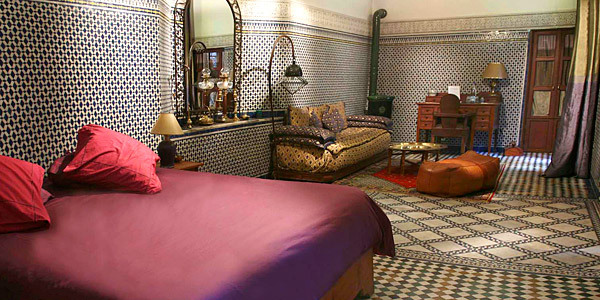 This riad was one of the first boutique openings in Fes and in our eyes, thanks to attentive hosts, stunning traditional interiors and wonderful food, it is still one of the best. 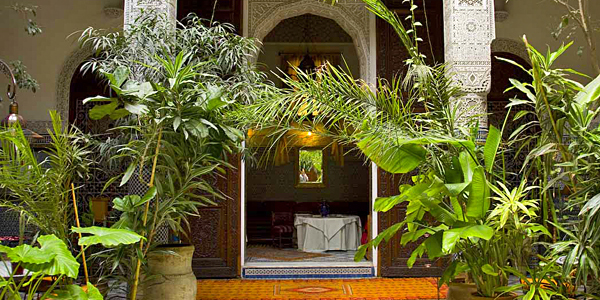 Rooms: In typical riad style, the 8 rooms and suites at Riad al Bartal lead from a central plant-filled courtyard. 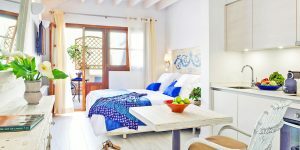 They are all beautifully furnished with local artwork and artefacts such as antique camel bags, old Berber rugs, artisan carvings and French colonial paintings. This wonderfully transforms the large, lofty spaces into cosy hideaways, particularly when coupled with the addition of a fireplace or ceramic wood stove. The cosy Double Rooms (Kirwan and Cordoba) are the smallest, with raised sleeping lofts and fireside seating below, while the Berber Room is similar in layout but offers slightly more space. We stayed in the stunning and vast, but surprisingly cossetting, Suite Agadez. If you’re looking for a bit more space, Seffarine, the 2-bedroom Suite, is a great option – it also has an amazing copper tanning vat for a bathtub. All rooms are suitably low tech (you won’t find TVs, radios, telephones or minibars), though there is WiFi in some communal areas. Food: The French owner, Raymond, employs fantastic local cooks meaning that the food is not only delicious, but also a spoiling reflection of Moroccan tastes and cuisine. During one dinner, we were served starters of miniature pastilla, guacamole and sweet tomato, and onion and cinnamon paste with fresh breads, followed by a chicken and aubergine tagine (complete with obligatory olives). 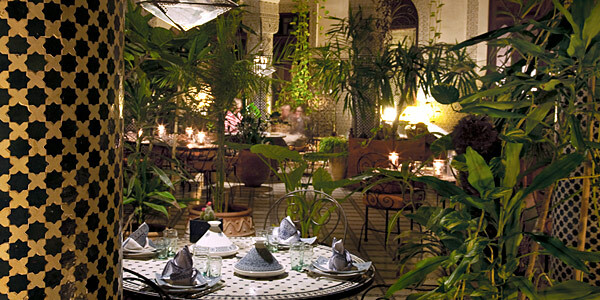 However, it’s not just what’s on the plate that makes for a fantastic feast; the candlelit tables carved out of the courtyard foliage, the gentle murmur of voices chatting, and the strumming of an acoustic guitar all make for a relaxed and romantic atmosphere. Bon appétit, indeed. The breakfasts (included in the room rate) are just as tasty. You can expect a huge selection of breads, crepes, honey and cheese, olives, omelette and (our highlight) an amazing sweet potato jam. Should you wish to sample the gastronomic delights of Fes itself, the broad range of busy street-food stalls and spoiling restaurants ensures you’re spoilt for choice. Raymond, and his wonderful staff, will be more than happy to advise. Top Tip: The team can recommend official guides to show you around Fes. We think it’s worth it, at least on your first day, as you’ll learn more and avoid having to fend off touts the whole time. 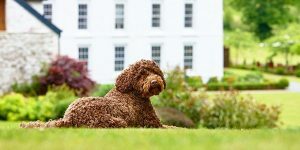 We also advise pre-booking supper at the hotel one evening (perhaps for your arrival day) – the leafy courtyard setting is magical, and the food is exquisite.